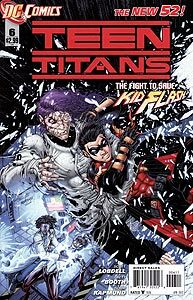 Brief Synopsis: The Teen Titans turn to S.T.A.R. Labs to aid Kid Flash. Issue Notes: Booster Gold does not appear in this issue, though an advertisement featuring Booster Gold does. Booster Gold is seen on a billboard in New York City. Since the only words visible are "Booster Gold," it is unclear what product, if any, this billboard is advertising. PRODUCT PLACEMENT: "Need a Boost!?! Booster Gold Coffee!" The waiting room at S.T.A.R. Labs in Metropolis contains a commercial coffee vending machine selling Booster Gold Coffee. Is this a Sundoller Coffee product, or is Booster now marketing his own brand of coffee?